The most cost-efficient option for me to get from the US to Belize this past November was to fly to Cancun, Mexico and then take an overnight express bus to Belize City. Being a birder, I purposely scheduled my flight to arrive in Cancun early so that I could have the entire afternoon to roam around the city before the bus left at 10pm and see what birds I could turn up. After a quick stop in Ft. Lauderdale, I arrived in Cancun around 11am and was eager to get outside and start tracking down some new birds. As soon as I walked out of the airport, I heard the raucous calls and shrieks of Great-tailed Grackles and noticed some movement in a clump of bushes near the shuttle terminal, so I walked over to investigate. 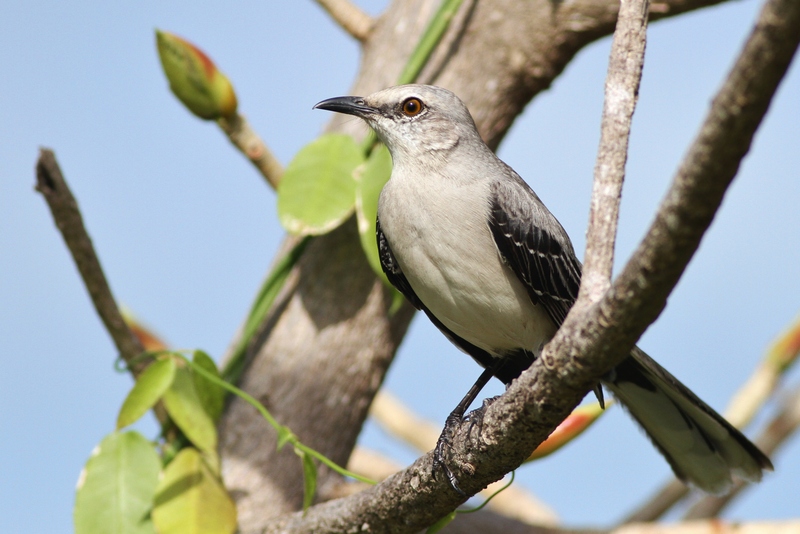 A Tropical Mockingbird flushed out – my first lifer of the trip! 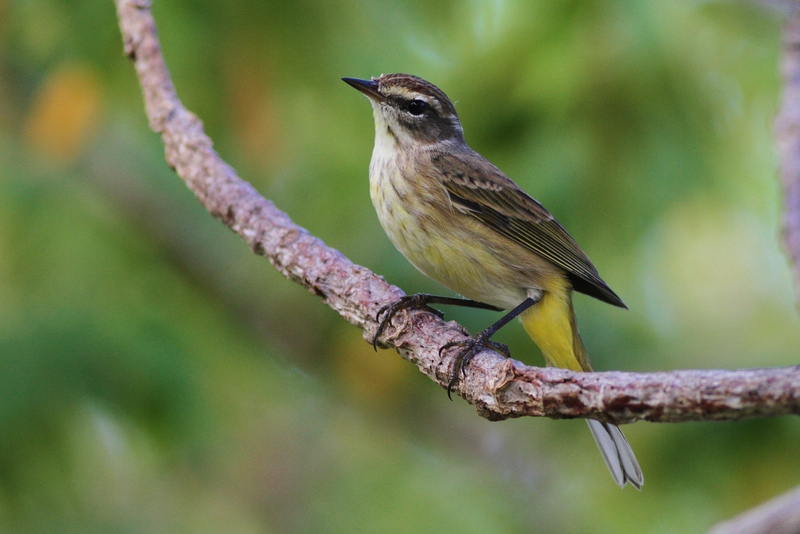 I eventually became quite familiar with this species during my time in the Yucatan, as they were common in open areas (especially near humans) from Cancun south to about three quarters of the way down through Belize. 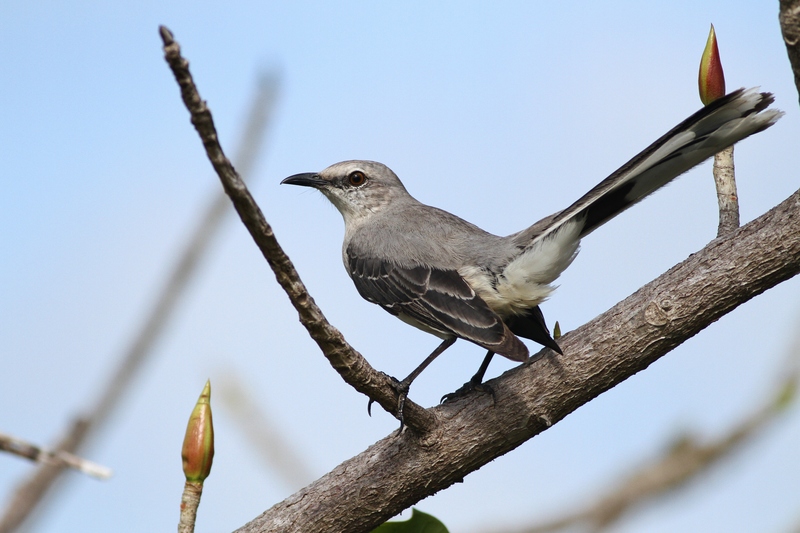 Their habits and appearance is very similar to the Northern Mockingbird, but it lacks the large white patches in it’s wings. From the airport, I took a shuttle to the bus station in Cancun to make sure everything was good to go with the overnight express bus and then set out to find some birds for the afternoon. Checking my phone, the closest bit of ‘habitat’ was also in the direction of the ocean, so I threw my backpack on (which I was starting to realize was a bit too heavy), and started walking east. Once I got away from the hustle and bustle of downtown Cancun, I started to see Magnificent Frigatebirds soaring overhead – a welcome sign that I was in the tropics! As soon as I reached the first clump of brush, I tried pishing to see what I could lure out. Right away a black bird crawled up from the darkness and perched directly in front of me – a Black Catbird! This was another lifer for me, and a pretty special one at that. Black Catbirds look very similar in shape and size to a Gray Catbird, but are entirely black with a red eye. Gray Catbirds are also well-known generalists and quite wide-spread and insanely common, however the Black Catbird is restricted to only the Yucatan peninsula, and only found in or near mangrove habitats along the coast. In a very stupid and naive move, I didn’t want to unpack my backpack quite yet to get my camera out for a photo of the catbird, assuming since it was literally the first bird I found, there would be many more. Little did I know that would be the last Black Catbird I would see until a month later and wouldn’t get such a close, unobstructed view again. Needless to say, I don’t have any Black Catbird photos. American Redstarts, ‘Northern’ Yellow Warblers, and ‘Western’ Palm Warblers were quick to respond to my pishing and I enjoyed seeing them on their wintering territory. I always find it interesting to observe a bird during the ‘other’ part of it’s life; away from the temperate environments that I am so used to seeing these familiar species. A few minutes later I heard a bird singing that I was unfamiliar with. 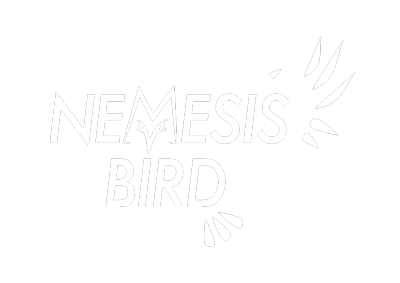 It sounded sort of like a vireo, but wasn’t quite right. I frantically walked around the trees it was singing from, straining my neck to get views up into the higher branches and trying my hardest to get a good angle on the bird. My huge, heavy backpack swaying side-to-side, almost causing me to fall over. 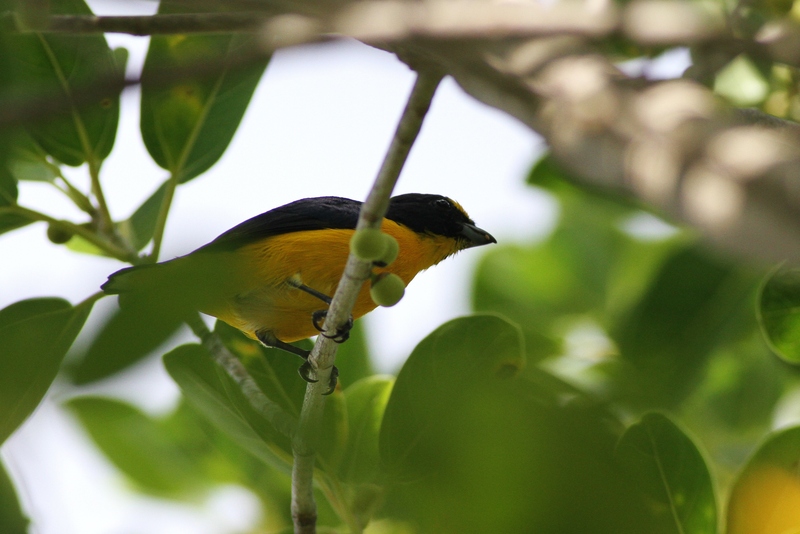 People walking past certainly thought I was an insane homeless person, but the singing bird didn’t judge me, and in fact dropped down closer for a better look – a male Yellow-throated Euphonia! My third lifer of the trip, and final lifer of the day. 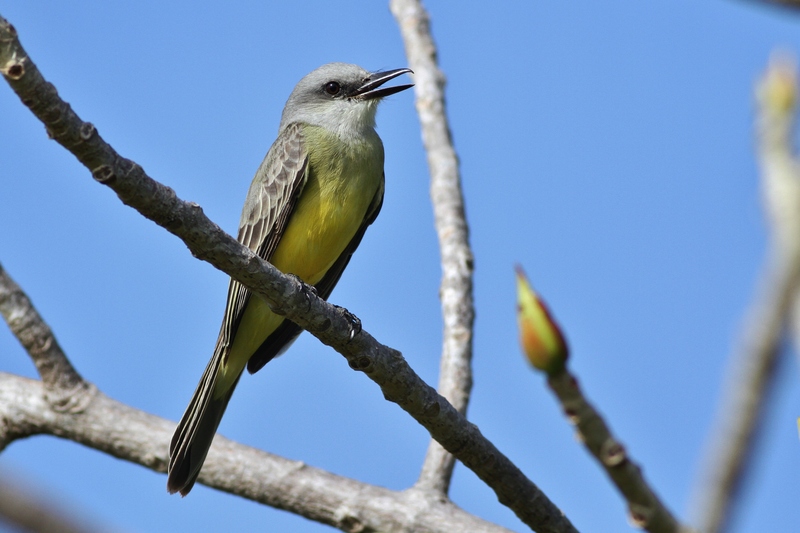 Taking a short cut through a future golf course, I found multiple Tropical Kingbirds and more Tropical Mockingbirds. 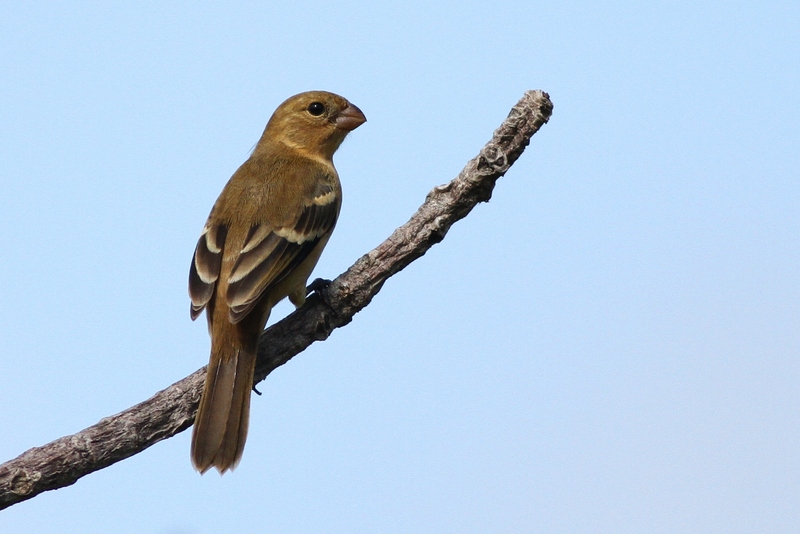 An area with some taller grass was housing some White-collared Seedeaters and a Common Yellowthroat. 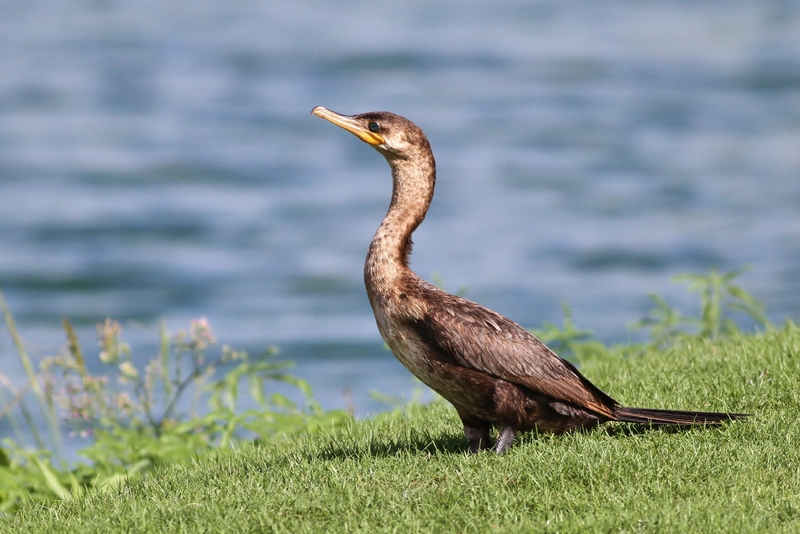 The golf course pond was very active with birdlife, with an immature Neotropic Cormorant and ‘Great White’ Heron (the white form of Great Blue Heron) sitting along the shoreline while multiple Northern Jacana, Black-necked Stilts, and a Spotted Sandpiper foraged along the water’s edge. 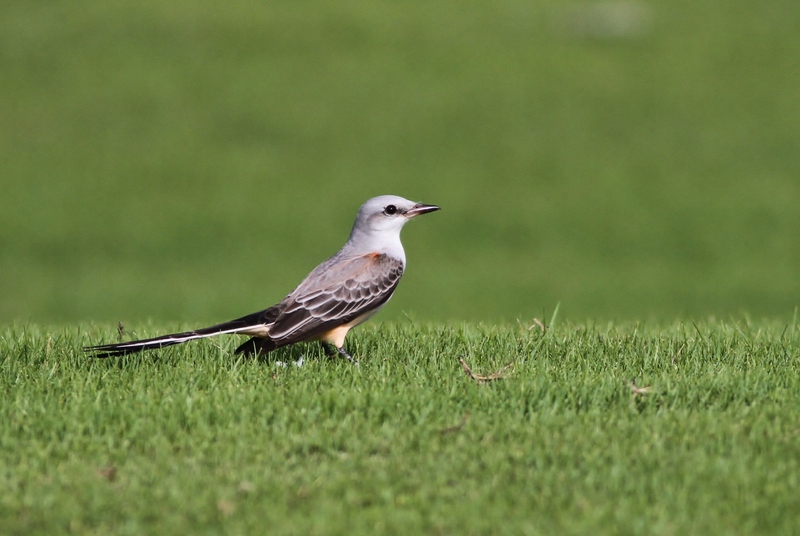 Four Scissor-tailed Flycatchers flew over, and one circled around to land near me on the mowed grass. Turkey and Black Vultures began to join frigatebirds in the sky, so I set my backpack down to take a break and scan the sky for other raptors. 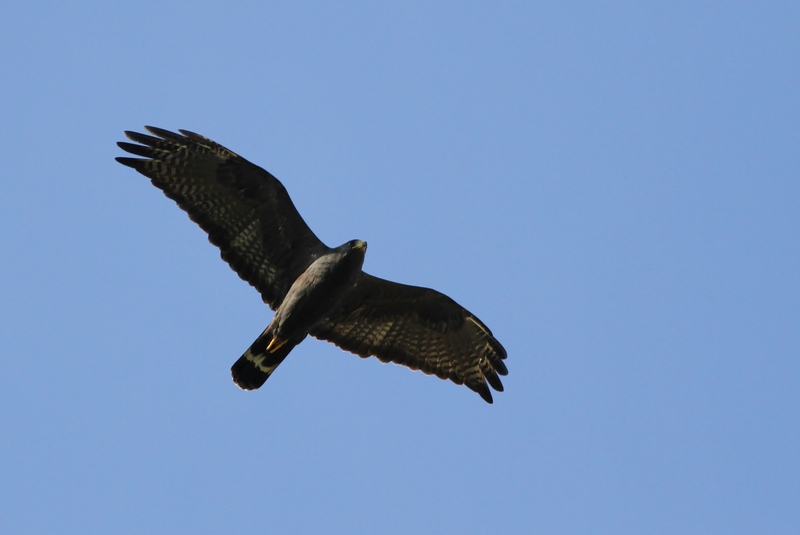 Looking off to the north, I spotted an adult light type Short-tailed Hawk soaring over a large mangrove forest. It was started to look like a small band of rain was headed my direction, so I walked towards some buildings to take cover. Sure enough, a light rain began which soon grew to a pretty intense downpour and I was lucky to find a small alcove to hide under and stay dry. After the rain stopped, I continued my walk towards the beach. Seemingly out of nowhere an adult Zone-tailed Hawk appeared in the sky, and I willed it to fly closer towards me but was temporarily distracted when an adult Peregrine Falcon shot past, heading the opposite direction. Once I turned to look back at the hawk, it was heading my direction and I shot off a few photos as it glided past. The Zone-tail would teeter and generally show off how well it could mimic the lazy flight style of a low-flying Turkey Vulture. I eventually made my way to a very nice oceanside park that had recently been renovated, and searched the patches of trees and brush for any birds that I could turn up. Out of the corner of my eye, I spotted a medium-sized dove fly past and then drop into some mangroves a quarter-mile away. Hoping it would be some dove I’d never seen before, I decided to walk in that direction. After a few minutes of searching through the mangroves, I discovered that the dove was one of multiple White-winged Doves roosting in the trees – not a lifer, but always a nice bird to see. The mangroves there proved to be loaded with many other birds too, and I had some of my best birding of the entire day without even moving more than 10 feet from the spot. More Tropical Kingbirds joined Social Flycatchers and Great Kiskadees foraging through the branches. 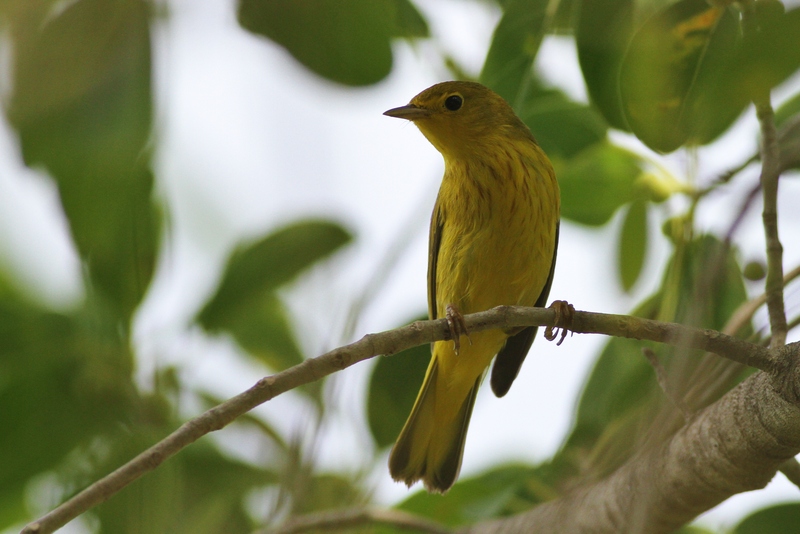 The tropical subspecies of Yellow Warbler, known as the ‘Mangrove’ Warbler were plentiful, including some stunning males with beautiful red heads. I also saw my first ‘East Mexico’ Golden-fronted Woodpecker, which actually doesn’t have a golden front at all! A Summer Tanager, Yellow-throated Warbler, and Northern Waterthrush also joined in the fun, as well as a stealthy Black Ctenosaur that was hiding among a pile of rocks nearby. 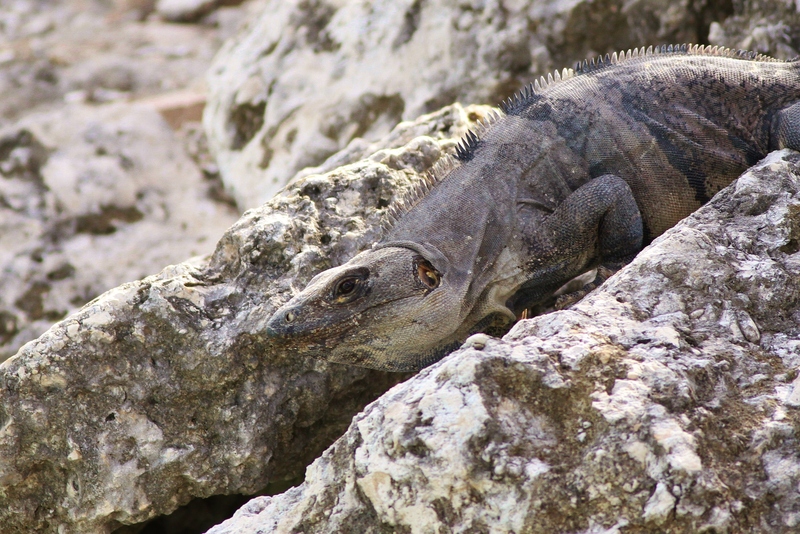 This large lizard is similar to an iguana but has a slightly different head shape, and the row of spikes on it’s back remain short and uniform and continued down it’s tail. This species has also been introduced into some areas of Florida, I believe. Ending the afternoon with 38 species as the sun dropped below the horizon, I made my way back to the bus station and grabbed some food. My afternoon in Cancun was a great introduction to the birds and other animals that I would see throughout my next month traveling around Belize, and I was happy to pick up a few cool lifers, especially the endemic Black Catbird!